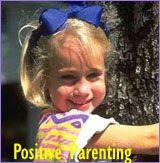 This positive parenting article is larded to bursting point with positive parenting tips and advice! I hope to satisfy whatever mood and need you have in terms of parenting tips. 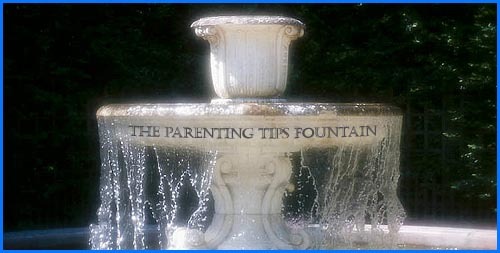 High-level parenting advice: Wise positive parenting insights that takes parenting a step further! Practical parenting tips: To make your everyday life easier and more pleasurable! Funny parenting tips: Good parenting humor for when you're in a mood for fun! What you 'put in' your child is going to be what your child will let out. It's very simple! This means that the way you deal with challenges and the way you respond to your child will highly influence the way your child learns to respond to you and to deal with challenges. In this article of 10 powerful positive parenting tips I will present you with tips on parenting that focus on how to give children empowerment. 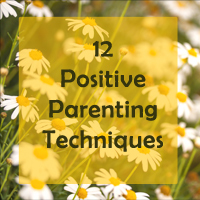 My aim with these positive parenting tips is to show you the incredible power a general positive attitude has in terms of bringing out the best in yourself and your kids! When parents divorce, the children are among the most difficult topic to agree upon. Parenting of children of divorce requires specific attention. 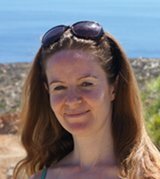 A parenting plan proved helpful in many occasions: read more about how to create a parenting plan by Children-and-Divorce.com. What are good parenting skills and what makes a good parent? Well, first and foremost what has helped me fill my own parenting life with genuine joy and pleasure is having a constant focus on my son's needs. Every time my son would be unhappy, it would be because he had an unfulfilled need (a need for e.g. attention, touch, autonomy etc.). Trying to provide my son with what he needs - not necessarily what he wants) - but what he really needs has been paramount in building a happy and healthy child parent relationship. In this article of positive parenting advice [link] I will present you with a list of what I consider good parenting skills and advice as to how to use them in your own life!. Also you'll get to make your own personal parenting worksheet where you'll be able explore your own good parenting skills. We all know the situation: We need to make our kid do something and not very surprisingly our child doesn't want to! In this article with positive parenting techniques I will take you through a typical day of mine and share with you how I deal with typical everyday toddler challenges such as getting going in hectic mornings, tooth brushing, putting on clothes, cooking while having a tired, cranky child, bedtime rituals etc. My main tools are: Using the power of my intuition, gut feeling and unconditional love as primary parenting guidelines rather than fixed, disciplinary rules. 'Discipline' Yourself and You'll Automatically 'Discipline' Your Child! I will be straight with you: I have a problem with the word discipline. Because raising happy, conscious and responsible children has very little to do with teaching discipline rules and everything to do with the concrete way you relate to your kid! In this positive parenting article of positive discipline techniques I will turn the concept of disciplining your children upside down. In my view, it's all about being conscious of your own behavior as a parent. 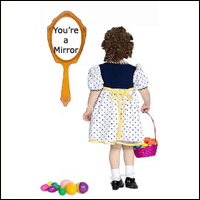 Because you're a mirror to your child - a role model! Therefore whatever you want your child to learn, don't teach it, do it yourself. Use the mirror effect - it's incredibly powerful! So, whatever you want from your child: compassion, respect etc. - be those qualities yourself and you'll be surprised about the effect! As human beings we all have deep qualities that can be healthily and successfully used in parenting. In this original article you will get 10 parenting tips of how to practically use your human qualities in your parenting. Your Soul: Wise intuition, high-level consciousness and strong gut feeling! Your Heart: Love, compassion and acceptance! Your Brain: Mental logic and reasoning! Your Body: Touch and play! 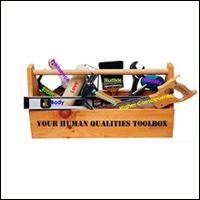 Your Personality: Your specific personality gifts! Your Whole Identity: Being true to who you are! Your Natural Skills: Making life easier by doing what you're good at! Your Presence and Focus: Being in the Now! Your Critical Sense: Questioning your beliefs! Your Sense of Humor: No need to take everything equally seriously! A Rich Collection of Positive Parenting Solutions to Your Everyday Parenting Challenges! 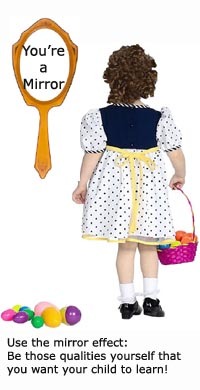 On this with practical parenting advice [link] you'll find a multitude of typical challenging child situations that cause many parents to pull out their own hair in sheer desperation. Below each situation e.g. : "My child doesn't eat" or "My child hates going to bed", you will find a list of several good solutions: Most solutions will be my own special recipe, others will be insightful knowledge from other parenting sources. Everything here is focused on what actually works for both you and your kid! The Best Parenting Tips from Famous Child Experts! 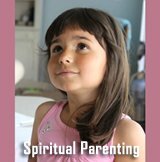 Read great tips on parenting [link] from famous child experts - enrich yourself with a true goldmine of the best and most insightful parenting quotes! How to Avoid Parenting Stress! During our day there are so many things to consider and do. And then ad a child or two to the equation and chaos may be imminent and stress highly likely. In this article with tips for moms [link] I will suggest some ways for you to be more efficient and organized on the one hand which leaves time for you kid on the other hand. - A Parenting Article with Mommy Tips! In order to fully enjoy parenting we also need time off it! We need to take care of ourselves and spoil ourselves a little with some precious self care. In this article with mommy tips [link] I will present you with a special list of tips and ideas for your own well-deserved and probably highly needed self indulgence! Totally Far-out Tips to Make You Smile! Grab a cop of coffee and allow yourself not to be thinking about serious parenting for a few minutes. 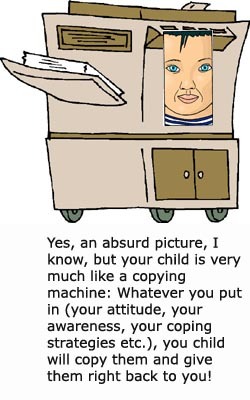 In this parenting article with funny drawings and funny sketches you'll get absurdly funny parenting tips illustrated by me. 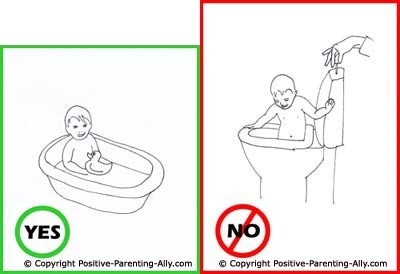 This good mom humor article features tips on toddler toilet training, bathing toddler, brushing toddler's teeth, toddler playground activity, toddler sleeping rituals, and toddler bedtime stories. Hope they'll give you a quick laugh and light up your day! In the same humorous spirit as in the above article I wish to make you smile in the name of funny parenting. In this article you'll get to see a true funny parenting tip treasure, namely funny parenting tips delivered as funny parenting videos and funny kids videos. They are just hilarious, prepare for a great laugh!